The roots of thirty-six years of Schooner Fare’s music lie deep in the maritime traditions of Downeast. The stories and songs associated with the sea migrated with the sailing trade, and sailors from all over would create new songs about their experiences and spread them worldwide. So many maritime songs are considered “Irish” songs that often the two genres are indistinguishable. The Clancy Brothers and Tommy Makem introduced these songs to the American audience in the late 1950’s, including us......and then the world. This album has a reflective mood. As it turns out, it wasn’t intentional but a natural occurrence at this point in all aspects of our lives. Several of the songs are from our roots as performers. A few are not new songs but are a welcome addition to our repertoire. Some are completely new songs, decades removed from the start of our journey. All elements are testimony to the wings to grow we’ve been given by those who joined us at some point along the way. Our thanks to each and every one of you. The resurgent interest in Celtic music is due largely to the Clancy Brothers and Tommy Makem. Schooner Fare was able to build its repertoire of maritime songs and Irish songs concurrently and sing them in interchangeable venues. 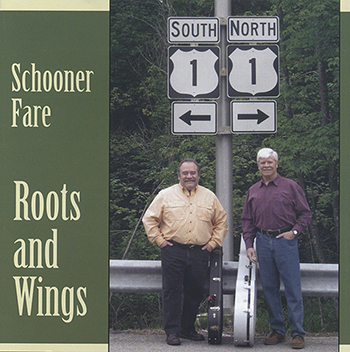 The recording of Schooner Fare’s “Day of the Clipper” by Makem & Clancy in 1978 launched Schooner Fare into another professional arena. We have Tommy and Liam to thank for helping us build our credentials as well as for years of friendship and inspiration. They are deeply missed. And we hope in a short time to see you again. From Boston to Portland ‘tis 25 leagues. Then we hove our ship to, for to strike soundings clear. And straight up the channel to Portland did steer. With health to each jovial, true-hearted soul. And some blessing something less than you’d bestow. Are wings that can surely bring you home again. It’s good-bye and God be with you says old Johnny Dhu. song was written in the 1840s by Charles Jeffreys and Sidney Nelson. this version we do is slightly different from the original. Was the Rose of Allandale. ‘Twas the Rose of Allandale. performed it, disclaimer notwithstanding. Caveat emptor. Fair thee well, my lovely Dinah, a thousand times adieu. For we’re going away from the Holy Ground and the girls we all loved true. And the good old ship is tossing about and the rigging is all tore. And the secret of my mind, my love, you’re the girl I do adore. And now the storm is over and we are safe and well. We will drink strong ale and porter, and make the rafters roar. And when our money is all spent we will go to sea once more. experiences. For others, spirit itself is ample. Cannot cure the impression that’s on the heart. All the kids were making sweet, angelic fans. We were making angels in the snow. While making angels next to you. I believe that would be one of the best of all. Combing her hair by candlelight. “What would I do with your ships on the ocean? What would I do with your houses and land? What would I do with your gold and silver? mortality and a wish to be remembered well by those whom you loved. Our inability to control either ultimately unites us all. That’s how you’ll remember me. Reminds you of our singing. and Tommy Makem, has been a staple in Irish pubs for years. While the land-lubbers lie down below. We shall sink to the bottom of the sea. And tonight she’ll be weeping for me. Than I do for the bottom of the sea. This Scottish classic was written to celebrate holidays with loved ones. Let us not wait for such occasions to do so.